Varying the intensity of aerobic exercise in a structured format may help boost your energy and reduce fatigue. When you have MS, getting the right amounts and types of exercise can be crucial to your health and well-being. But for various reasons — including, in some people, fatigue — many people with MS don’t get as much physical activity as they should. In fact, a recent analysis published in April 2017 in the journal Multiple Sclerosis and Related Disorders looked at several studies and found that people with MS exercise significantly less, overall, than healthy people who don’t have MS or another medical condition. But especially for people with MS, it’s important not just to exercise, but to do it in a smart, efficient way. This means doing exercise that will help build or maintain your strength and energy level without making MS-related fatigue worse. One exercise technique that may hold promise for people with MS is interval training. By applying this principle to aerobic exercise, you may be able to reduce fatigue and increase your overall sense of wellness. But first, you should find out why this type of exercise may or may not be a good fit for you. Learn About a Pneumococcal Vaccine. Interval training refers to an exercise program in which the intensity of the exercise is varied in a structured way. For example, in a study published in September 2016 in the journal Annals of Physical and Rehabilitation Medicine, 26 people with MS did a workout on a stationary bicycle involving a 10-minute warm-up, then 1 minute of high-intensity cycling at 90 percent of their maximum heart rate followed by 3 minutes of low-intensity cycling. The intervals of high-intensity and low-intensity cycling were then repeated five times for a total workout time of 30 minutes. In this study, the interval routine was paired with a strength-training routine for a total of two or three sessions each week. After several weeks, participants reported improvements in vitality, emotional well-being, and general well-being on a questionnaire, and 23 of the 26 said they continued to engage in regular physical activity. According to Kathleen G. Brandfass, a physical therapist and director of neuro and geriatric outpatient services at the University of Pittsburgh Medical Center in Pennsylvania, interval training can incorporate a variety of aerobic exercises, including stationary cycling (upright or recumbent), using an elliptical trainer, walking outdoors or on a treadmill, and therapeutic aquatics. It’s also important to include some aerobic training involving the arms, Brandfass says, “especially if somebody’s legs are more involved” in MS-related symptoms. Using an arm bike can be a good way to start interval training in that instance, she suggests. Several different studies have shown that interval training may be beneficial for people with MS — but most of them have been small, and none has shown definitively that interval training is better than traditional, sustained aerobic exercise in people with MS. In addition to the September 2016 study noted above, a study published in September 2015 in the journal PLOS One also examined high-intensity interval training in people with MS, this time comparing it with high-intensity continuous aerobic training, as well as being sedentary, for 12 weeks. Both exercise groups saw substantial improvements over being sedentary, but the two approaches had somewhat different effects. Certain types of muscle fibers grew more with continuous exercise, while others grew more with interval training. Leg muscle strength, by certain measures, increased more with continuous exercise — by an average of 45 percent, compared with just 13 percent in the interval group. But the interval group lost slightly more of their body fat — 3.9 percent versus 2.5 percent — and only the interval group saw an increase in endurance and lean tissue mass. Overall physical activity increased in the interval group by 86 percent, and in the continuous exercise group by 73 percent. 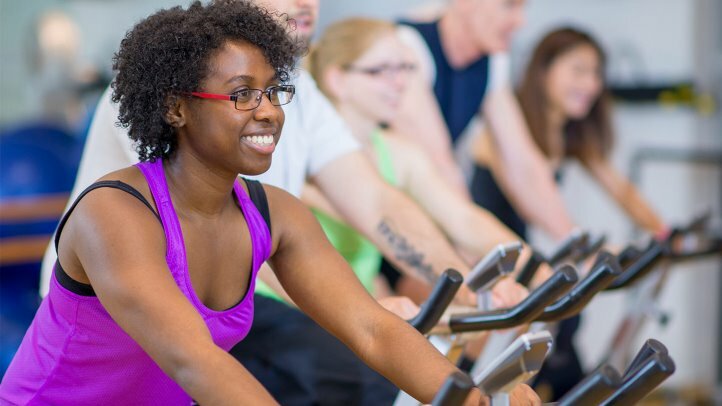 In another study, presented in a poster session at the American Academy of Neurology annual meeting in April 2017, 40 people with MS were assigned to either high-intensity interval training or moderate endurance training on a stationary bike three times a week for eight weeks. At the end of this period, members of the interval group reported significantly less fatigue, while the endurance group didn’t experience any overall change. According to Brandfass, interval training may be a good option for some people with MS — but only if you’ve already established a basic level of endurance first. When starting any type of physical activity, “the first variable that you work on is time,” she says. This means exercising continuously for 5, then 10, then 15 minutes before adding any high-intensity intervals to your routine. It’s important in any exercise regimen, Brandfass stresses, that people with MS avoid practices that could lead to overheating and fatigue. “Lots of people are motivated to exercise, but if they have these roadblocks — like they overfatigue themselves, or they overheat themselves — those will be deterrents,” she says. Rather than experimenting with interval training on your own, Brandfass recommends seeing a physical therapist with neurological training to get started. In addition to working on your strength, endurance, and balance, “We’re really also trying to work on what’s going on with the brain,” she says.